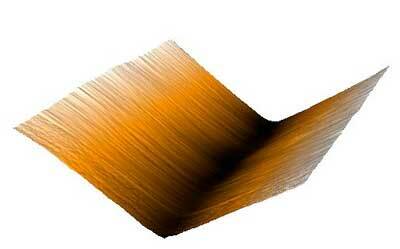 (Nanowerk News) Researchers from Brown University have discovered another peculiar and potentially useful property of graphene, one-atom-thick sheets of carbon, that could be useful in guiding nanoscale self-assembly or in analyzing DNA or other biomolecules. A study published in Proceedings of the Royal Society A ("Critical curvature localization in graphene") demonstrates mathematically what happens to stacks of graphene sheets under slight lateral compression -- a gentle squeeze from their sides. Rather than forming smooth, gently sloping warps and wrinkles across the surface, the researchers show that layered graphene forms sharp, saw-tooth kinks that turn out to have interesting electrical properties. Those previous experiments involved graphene sheets and buckyballs -- soccer-ball-shaped molecules formed by 60 carbon atoms. Researchers dumped buckyballs onto different kinds of graphene sheets and observed how they dispersed. In most cases, the buckyballs spread out randomly on a layer of graphene like marbles dropped on smooth wooden floor. But on one particular type of multilayer graphene known as HOPG, the balls would spontaneously assemble into straight chains stretching across the surface. Kim thinks flexoelectric crinkles can explain that strange behavior.